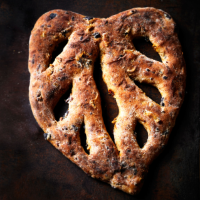 Walk into any Provençal market and you’ll be hard pushed to resist the spindly charms of a freshly baked fougasse, fragrant with melting cheese, olives and anchovies. Its shape is said to resemble an ear of wheat. If you like crusts, this is the bread for you. 1. The night before, prepare the poolish. Beat the fl our and yeast with 75ml hot water. Scrape down the sides, cover with cling fi lm and set aside at room temperature for 8-16 hours. 2. The next day, mix the fl our, salt and yeast, then slowly incorporate the poolish, honey and 80ml hot water until you have a smooth and slightly sticky dough. 3. Use some of the sun-dried tomato oil to coat your hands and lightly grease the work surface, then vigorously knead the dough for 1 minute. Rest for 10 minutes. Knead again with well-oiled hands for 1 minute; rest for 10 minutes more. 4. Press the dough out as fl at as you can; tip the tomatoes, olives, gruyère and thyme into the middle. Fold up and knead for 2-4 minutes, until everything is evenly dispersed throughout the dough. Transfer to a bowl, cover loosely with cling fi lm and leave to rise for 1 hour, until doubled in size. 5. Generously fl our a large fl at baking sheet (upturn a rimmed one if need be). Stretch out the dough in a large leaf shape, about 2cm thick. Use a sharp, fl oured knife to make a slash down the centre, then slash 3 times either side, to make a leaf, pulling the dough apart to open up the holes. Cover with oiled cling fi lm and leave to rise for 1 hour. 6. Preheat the oven to 200˚C, gas mark 6. Carefully stretch out the dough to redefi ne the shape. Bake for 12 minutes, then slide off the baking sheet and cook on an oven rack for 3-5 minutes. Cool on a wire rack before serving.